Senior Airman Kevin Greene, a health care management technician with the 920th Aeromedical Staging Squadron, stretches after a short workout Aug. 8, 2017 at Patrick Air Force Base, Fla. Greene lost a portion of his left leg in a motorcycle accident on Dec. 17, 2014. 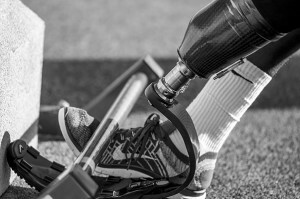 For most, an amputation would be the greatest challenge they have ever faced in life, but for one Reserve Airman, the real struggle came when he fought to keep serving. Separation from the service he loved so much was never an option for Senior Airman Kevin Greene, a health care management technician with the 920th Aeromedical Staging Squadron, and after a two-and-a-half-year fight, including three rejection letters and an in-person medical evaluation board, he is once again wearing his Air Force blues and loving every minute of it. Greene ended up going through several more surgeries, after his initial amputation on Dec. 17, 2014, as the same leg became infected multiple times. His last surgery in February 2015, left him with three quarters of his left leg. 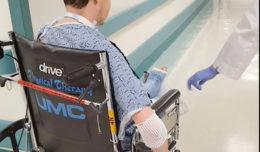 During his roughly two-month stay at the hospital, Kevin recalled always being surrounded by family, friends and co-workers. 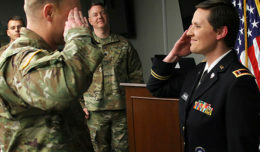 Greene said the support and mentorship he received from the squadron’s health services superintendent, Chief Master Sgt. Dorlen Martin, was especially meaningful. Martin said she will never forget that first hospital visit. 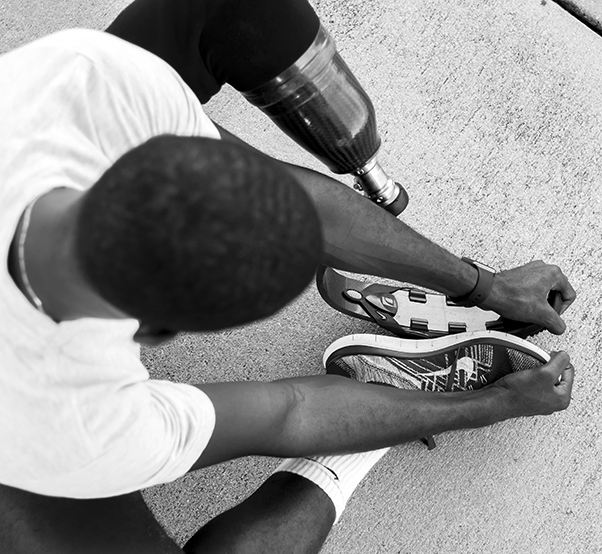 Senior Airman Kevin Greene, a health care management technician with the 920th Aeromedical Staging Squadron, stretches after a short workout Aug. 8, 2017 at Patrick Air Force Base, Fla. Greene, who lost a portion of his left leg in a motorcycle accident on Dec. 17, 2014, is the first and only Air Force Reserve amputee to serve at Patrick AFB. “It takes a lot to make me cry,” she said. “He’s just such a jokester. He’s always making light of everything. Martin said she couldn’t let Greene see her cry because he would have focused on her, when he should be focusing on himself. Unfortunately, Greene found out the hard way that donning the Air Force uniform again wasn’t an easy feat. During his first year of recovery, he had a lot of work ahead of him to get back into top physical shape. After getting fitted with his first prosthetic in March 2015, he decided the road to recovery was best walked. After returning to Florida, Greene decided it was time to get a job again, while he continued to physically ready himself for military service. He followed his passion of working with kids at a local recreation center and coaching youth basketball at a nearby high school. After a year in recovery, Greene’s unit submitted his first participation waiver to Air Force Reserve Command to be able join them on drill weekends. It was denied. He then faced an initial review in lieu of board in January 2016, which was also denied. But Greene refused to quit. Greene’s next step was to submit a world-wide duty request in the spring, which was again denied by AFRC. While Greene continued to fight to serve his country, he discovered another calling along the way — helping autistic children. That fall, Greene applied for a position at Kaliedescope Interventions, where he works with lower functioning, non-verbal autistic children ages 3-8. 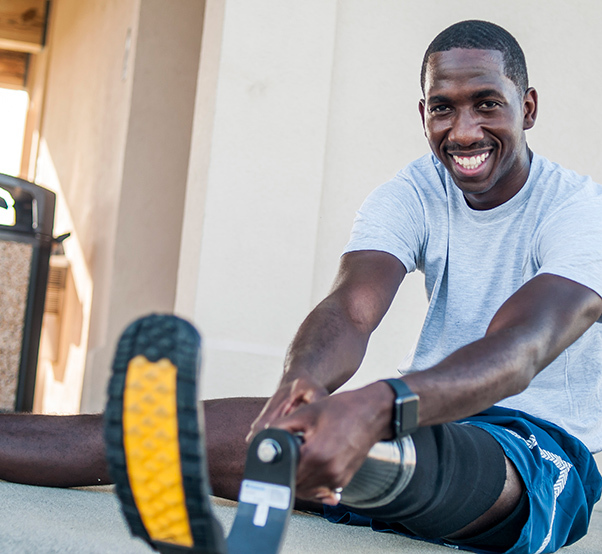 Senior Airman Kevin Greene, a health care management technician with the 920th Aeromedical Staging Squadron, proves that he can meet Air Force fitness standards with his prosthetic leg Aug. 8, 2017 at Patrick Air Force Base, Fla. Losing steam in a more than two-year battle, but never giving up, Greene faced his final stepping stone back to military service April 2017 when he traveled to Joint Base San Antonio-Randolph, Texas, to face a medical evaluation board. In addition to talking with board members, he had to pass the Air Force physical fitness test. He did well on the waist measurement, push-up and sit-up portions of the assessment, and then came the run. On his flight home from San Antonio, Greene received word that he passed the board and was being reinstated into the Air Force Reserve. This year Greene became a father to a baby girl named Gianna. He said he wants to inspire her to achieve her goals.